Turkey has been on the table for Christmas dinner pretty much every year of my life. It really is the must eat food at Christmas (along with the dreaded sprouts!) I did have a couple of years when I branched out into duck and goose but come 25th December it's traditionally been a 'big bird' taking pride of place in the oven of the Foodie Quine household. But it's not always been the case, before the widespread introduction of turkey to the UK 500 years ago the meat gracing the table at Christmas was goose, boars head and even peacocks! Today we are spoilt for choice and there's no need to stick to convention. Christmas dinner is constantly evolving to cater to various tastes, cuisines, allergies and dietary requirements. There's no longer a one size fits all approach. I'm lucky that I don't have too many foodie requirements to juggle over the festive season. My Dad is allergic to shellfish (and my daughter seemingly to vegetables...) but apart from that anything goes. Six months ago I headed down to London on the sleeper train to spend a rather hectic but immensely enjoyable day checking out Christmas In July events. These are showcases run by all the big brands and stores previewing their Christmas range. My first stop was Iceland Foods where I stepped into a veritable winter wonderland and got a sneak preview of what would be hot (or should that be cold?!) this Christmas! With over 200 delicious items in their Christmas range Iceland can provide everything from impressive centerpieces to show stopping deserts plus everything in between. I was wowed by Carrot Baubles, Macarons, Penguin Igloos, Lobster Thermidor, Mulled Wine Sausage Rolls, Chocolate Log Stacks and Luxury Whole Brined Turkeys. The tastiest trends of the year had all been incorporated to produce a fantastic range with an added touch of luxury at surprisingly affordable prices. Fast forward 6 months to now. All the products are now available instore and Iceland asked me to come up with a recipe for an Unconventional Christmas Dinner. My first thought was Salmon as we usually opt for something fishy on Christmas Eve. 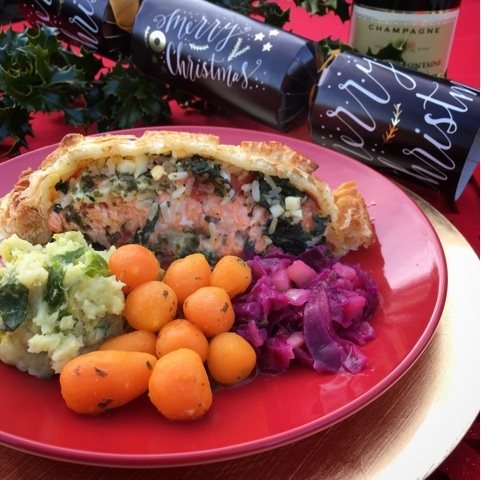 I remember my Mum making a rather wonderful Salmon Coulibiac for a festive dinner party and somewhere in my mind I thought that it was a Russian Christmas speciality. A quick Google told me I was right on the Russian bit but must have made up the festive bit! 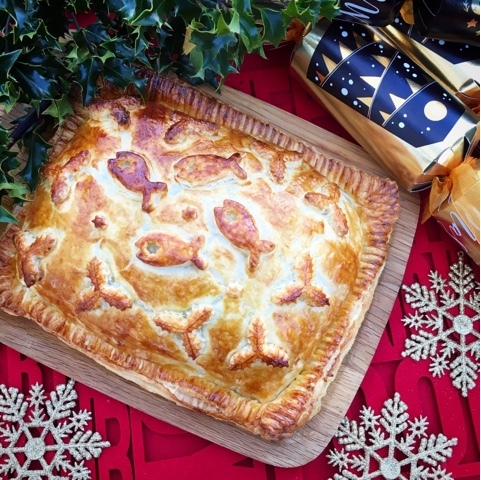 Either way it's a fantastic showstopper of a pie for a pescetarian Christmas dinner. It's absolutely perfect for entertaining as it can all be assembled well in advance. Leave it in the fridge until needed, then pop it into the oven just before you dish up the first course. I served it alongside three fab Iceland festive sides; Grilled Sprout Mash, Red Cabbage & Apple and from the Luxury range Carrot Baubles with orange slices and herb butter. To wash it down with I picked up a bottle of their Charles Montaine Champagne for an amazing £11.99 and I couldn't resist the award winning Luxury Mince Pies. With a little help from the the #PowerOfFrozen, Iceland has Christmas this year all wrapped up! This showstopping fish pie makes a great main for Christmas Day as it can be assembled in advance. The unbaked Coulibiac can be kept in the fridge for up to a day. Chill any leftovers and they will make a fantastic addition to a Boxing Day Buffet. Defrost the salmon fillets, rice, puff pastry and spinach thoroughly in a refrigerator. Roll out one pack of the puff pastry into a rectangle approximately 25cm x 30cm, this will be your base. Roll the second piece of pastry out to a rectangle slightly larger than the first, this will be the top of your Coulibiac. Place the base pastry sheet on a good solid baking tray, you don't want it buckling in the oven. 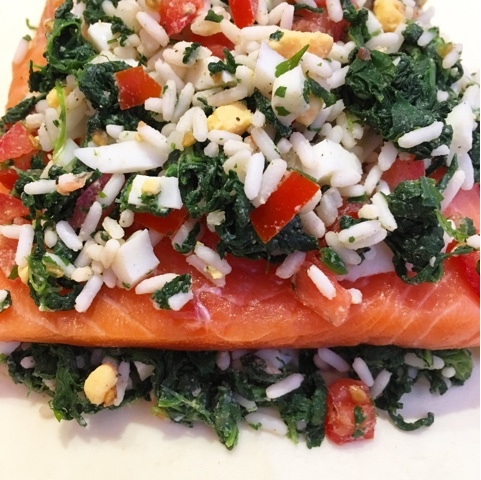 In a bowl combine together the rice, chopped spinach, diced tomatoes, diced hard boiled eggs, garlic and parsley. Season the mixture well with the grated Nutmeg, Salt & Pepper. Place half of the rice mixture in a rectangle on the pastry leaving a 3cm clear strip around the edge. Lay out the salmon fillets in a row on top of the the rice. Cover the salmon with the remaining rice mixture. Brush any stray grains of rice off the border, then brush the border with beaten egg. Drape the top sheet of pastry over the coulibiac and gently press the edges to seal the 2 pastry sheets together. Trim the edges to neaten and crimp all the way around with a fork to ensure a good seal. Use pastry trimmings to decorate your Coulibiac then brush the whole thing with beaten egg. To cook, preheat oven to 190c. Bake for 30 minutes until the pastry is golden brown. Serve the Coulibac cut in slices accompanied by melted butter mixed with an equal quantity of lemon juice. Can I make a confession? Before I started working with Iceland at the start of this year it was a store that I only really ever visited at Christmas to stock up on Party Food and the ubiquitous Prawn Ring! As I've found out more about the #PowerOf Frozen things have changed and I'm now a regular customer thanks to their tasty, high quality, innovative and convenient offerings. Perfect for festive meals but also supplying me with ingredients to cook up a storm the whole year round. Check out my previous posts in partnership with them to see what I mean and look out for further collaborations in 2017. Iceland Foods comepletely changed my perception too - not they are my go to place for almost everything, usual and unusual. I cant wait to try out more of their foods in 2017. Love your different take on XMAS eats. My freezer has always been well stocked but even moreso since I started shopping regularly at Iceland! I hear you Jane! My eyes have now been opened to how Frozen is often Fresher than Fresh. 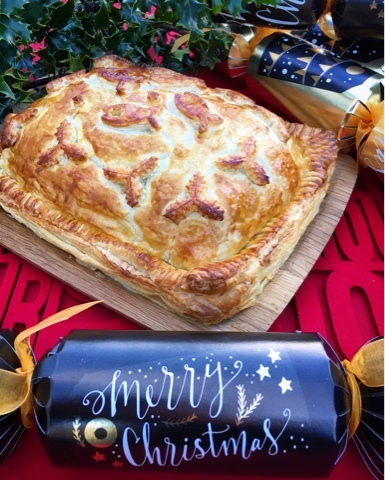 This looks great, I love the idea of a lovely salmon pie for Chrisrmas. Going to check out Iceland as impressed by all these ingredients! Thanks Lucy. I reckon it would work really well with all the traditional festive sides too. I'd definitely be up for Coulibiac, Kilted Sausages and Cranberry Sauce! Wow, this is quite the show stopper! What a fun party dish! Thanks! It definitely does make quite the party centerpiece. So pretty and festive! What a beautiful presentation. This would be super cool for New Year's also. What a beautiful meal! Thank you! You are right in that it would be ideal for New Year. It's great eaten cold too so perfect for a buffet table. We've got into the habit of eating fish pie on Christmas Eve but I'm not quite sure why! Love how different countries and cultures have different festive traditions. This looks AMAZING Claire! I'm a huge fan of salmon, and this would be the perfect Christmas dinner for me! Thank you! 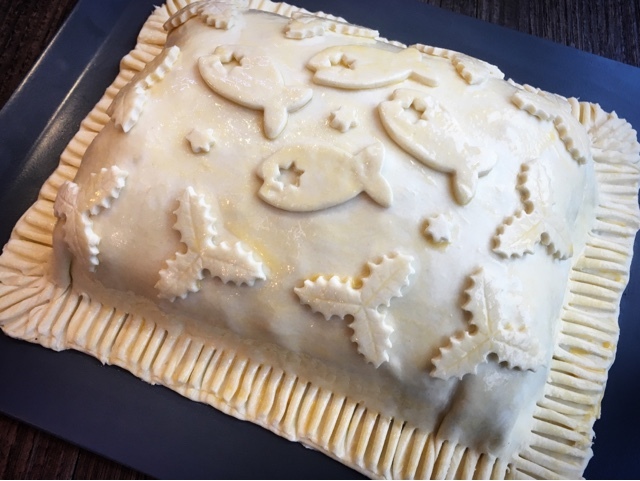 With a few cute cutters and some frozen puff pastry you can always produce an amazing looking pie. I love this recipe. I think that I might make it for Christmas Eve. dinner (feast of the 7 fishes) Thank you for this wonderful idea. WOW can I come to your house on Christmas Eve? A feast of the 7 fishes sounds right up my street! That salmon pie is quite the showstopper. I love what you did with the puff pastry. Frozen foods are definitely my favorite way to do my shopping ahead of time and getting it all done ahead during the holidays is even better! 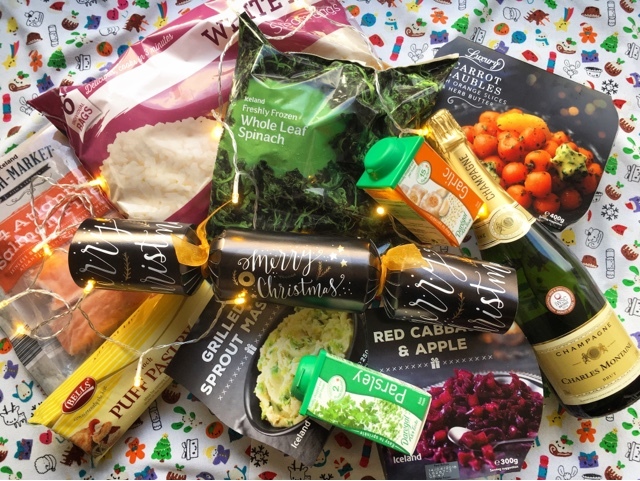 The Christmas Holidays are just so hectic that anything that can make things a little easier - like frozen food - is an absolute godsend! I love your decoration on this pie and I'm also loving Iceland's frozen range. Much more current than most people realise. I have rather a large collection of pastry cutters Jacqueline. One for every occasion! This pie look really good - I would love an alternative Xmas meal but my lot demand their roast turkey with the usual! Perhaps one year!! I'm sure you could sneak this onto the menu for either Christmas Eve or Boxing Day Heidi? Oh, this is such a great idea for a fish main course for Christmas dinner. I love anything wrapped in puff pastry. I'm a complete sucker for anything wrapped in Puff Pastry too! It's actually really easy to put together and once you've done all the prep you can sit back and take the glory as the oven does the rest! You have got to get yourself some of the Carrot Baubles. They really do look and taste amazing. I'd love this for Christmas dinner if we weren't going to eat traditionally! AS it could be prepared in advance I think it would make a lovely meal one of the other days when we've got family visiting. Absolutely! The whole Christmas feasting thing goes on for so much longer than just the big day itself that it's great to be able to ring the changes and step away from tradition at least some of the time. This is such a showstopping Christmas dinner! So great that you can make it in advance. And hurrah for frozen food! So much to be doing at this time of year that prepping in advance and frozen food come into their own even more than usual. Cant remember the last time i made one of these but it was a great dish and would easily make an alternative Christmas dinner. Its about time I made one again so I'm pinning for later. There would be a riot if i didn't serve turkey on Christmas day. I totally get that for some it just has to be Turkey on Christmas day, this would however be perfect for serving at any time of the the seemingly never ending festive period. It's such a good way of making salmon go even further. I'm not sure I'd ever not have turkey on Christmas day but this looks delicious for Christmas week with family staying. Things that are impressive yet can be prepared ahead are always good when you have visitors staying. Of course it's acceptable for all year round. Idea for Fishy Fridays! I'll try and join in as often as I can with Bake of the Week in 2017.